Malus 'Royal Beauty' lives up to it's name when the beautiful deep red/purple flowers emerge in April-May and decorate the gracefully weeping branches. The flowers are followed by small, dark-purple fruits in autumn. Although not suited to culinary uses, the fruits make a good display in the winter and are popular with a variety of wildlife. That's not all, as this purple weeping crab apple offers year round interest. Bursting into life with bronze/purple foliage in spring, the leaves turn a deep red/plum colour with a hint of green in the late summer and then adopt yellow and bronze tones in the autumn. Growing to just 3 x 3 meters in 20 years, Malus 'Royal Beauty' is a great feature tree even in small spaces. This pendulous crab apple is pollution tolerant, making it ideal for small urban gardens. 'Royal Beauty' is suited to all soil types and is happy growing in pots. 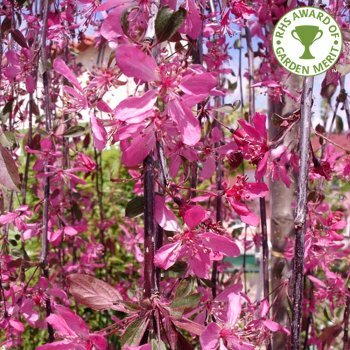 Our pot grown Purple Weeping Crab Apple trees can be planted at any time of the year. Start by removing weeds and grass within a metre of your desired planting hole. Dig a square hole as deep as your root mass and approximately 2-3x as wide. To help the tree establish more effectively, sprinkle root grow in the hole. Purple Weeping Crab Apple trees can be pruned in winter. They do not require hard pruning and you should not trim the tips of crab apple branches. Simply remove any dead or damaged branches and shoots at the base of the tree i.e. suckers and water sprouts which redirect energy resources from the main stem but do not produce strong branches.